about 2 hours ago Edwards was son of driver who saved Niki Lauda’s life British racing driver Sean Edwards, who was killed in a crash in Australia, was the son of former Formula One driver Guy, who helped pull Niki Lauda from his burning Ferrari at the 1976 German Grand Prix at the Nurburgring. Niki Lauda crashed in the 1976 German Grand Prix. Credit: DPA about 2 hours ago British racing driver was a passenger in fatal crash British racing driver Sean Edwards died when the Porsche in which he was a passenger instructing a 20-year-old male, hit a wall and caught fire. The wreckage of the car in Queensland, Australia. Credit: Reuters Monaco-based Edwards, who was leading the drivers’ championship in the 2013 Porsche Supercup season with one race to go, was reportedly taking part in a coaching day at the time. Edwards was instructing a 20-year-old man at the time of the crash. Credit: Reuters David Coulthard’s ‘shock’ over death of ‘talented racer’ Former Formula One driver David Coulthard has tweeted: shocking news about Sean Edwards passing, top man and super talented racer, condolences to his nearest and dearest. From @therealdcf1 on Twitter: London British motor sport racing driver killed in Australia crash The governing body for UK motor sports has paid tribute to a “hugely promising” young driver from London killed in a crash. Sean Edwards was a passenger in a Porsche when it reportedly hit the barriers at Queensland Raceway in Australia, during a private test session. 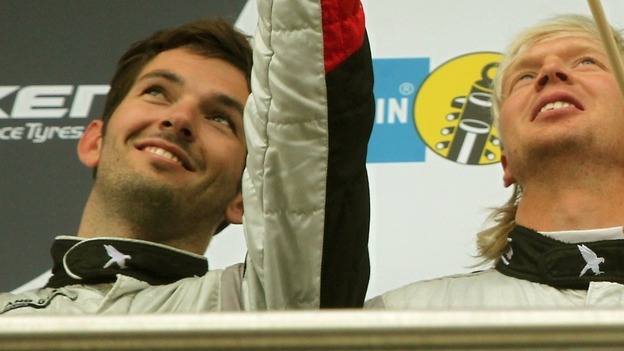 Sean Edwards (left) seen in May at Nuerburgring in Germany following a race Sean Edwards is the son of Guy Edwards, the British former Formula 1 driver. He wasborn in London but was living in Monaco. He was the 2013 Porsche supercup championship leader. London Motor Sports Association ‘shocked’ by driver’s death The Motor Sports Association is shocked and saddened by the loss of British racing driver Sean Edwards, who died in an accident on Tuesday in Australia.